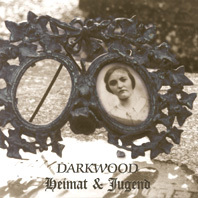 As a continuation of the last track of "In the Fields" and as a consequent result of travelling through the West, Darkwood deals with memories of Homeland & Youth in relation to the storm that has raged in Europe. According to the very mental topic, this album is rather dark and austere with noisy eruptions; and it had to abandon acoustic instruments and vocals. The CD comes in a beautiful digipack.